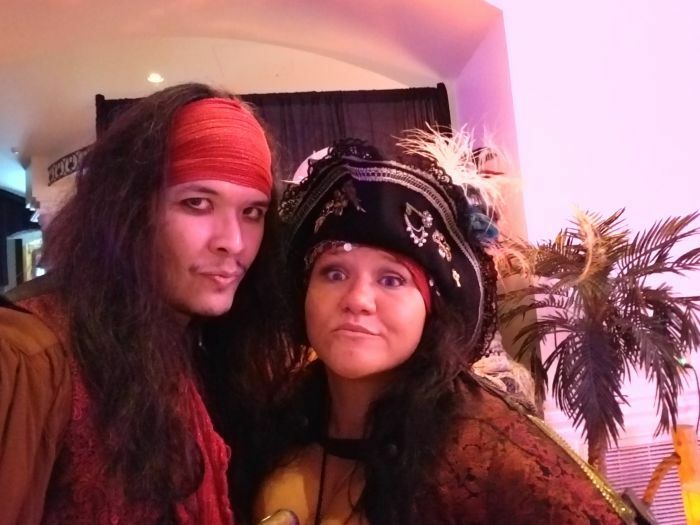 -I was invited once again by PIRATE QUEEN QUIGLY to be part of the crew at Pirates Weekend at EXIT 33 (TURNING STONE CASINO) in Verona, NY on Saturday 9/15/2018. I reprised my role as “Johnny Red”-but with a different look this time. There were many things different this year-less crew, no dressing room, one day instead of two and only being in the Lave / Tin Roaster /The Gig areas. There were also some familiar faces like CAPTAIN JACK FOR HIRE CNY , Jim Hanselman and Craig Loomis. There was also an undead pirate here, but I never saw him out of costume. All of them, as well as Miss Quigly of course did great-as usual. -Some additional pics can be seen on my Acting page on Facebook via the following link. This entry was posted in ACTING, THEATER and tagged acting, booty, Captain Jack For Hire CNY, Craig Loomis, Exit 33, Jim Hanselman, Johnny Red, live performance, NY, Pirate Queen Quigley, Pirate Weekend, pirates, Pirates of the Carribean, Turning Stone Casino, Verona, wayne w johnson, WWJ. Bookmark the permalink.